Collabor8 is an innovative new platform that allows brand owners and social media influencers to connect and instantly begin collaborating. We remove the middleman and give you ultimate control over your collaborations, enabling you to focus on what matters most to you - results! 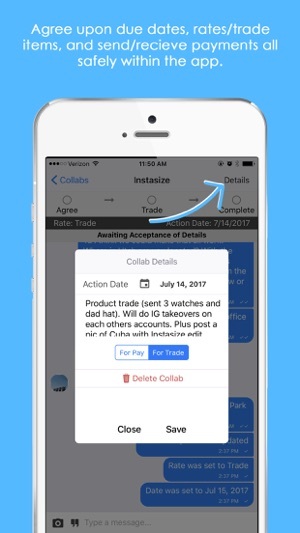 On Collabor8, you can easily create a profile, request to work with new people, chat, send and receive payments securely, leave reviews, and more. Social collaborations have never been this easy and convenient! 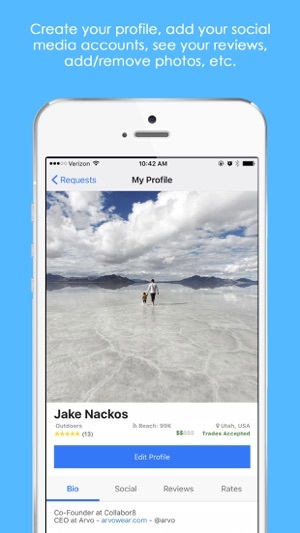 Create a profile today and see how Collabor8 can help elev8 your reach immediately. Collabor8 differs from other platforms by being exclusively inclusive - we don't turn anyone away from the app because we feel that anyone can be an influencer. Your influence may be relatively small and focused, or extremely far-reaching; either way, your voice can be a powerful marketing tool! Our robust filters allow brands to pinpoint the influencers that best fit their message (and vice-versa). Getting too many requests? No problem! Just adjust your "minimum follower count" filter to only receive requests from influencers that meet your criteria. - Allows brands to collaborate with other brands (and influencers), and enables fast account switching within the app for managing multiple accounts. * If you add a Standard or Gold Membership, your account will be charged the subscription fee for renewal each month within 24-hours prior to the end of the current period. Subscriptions and auto-renewal settings may be managed or turned off by going to your device's Account Settings after purchase. Download Collabor8 and join the influencer marketing movement! 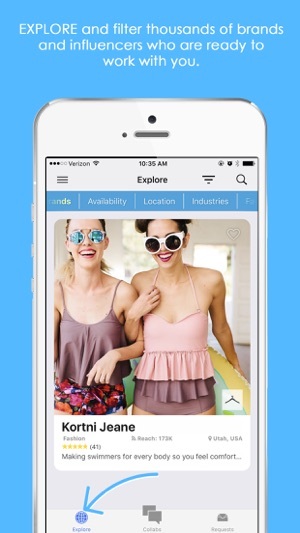 This app is very useful for influencers and brands/companies BOTH! I am an influencer currently but I have also tried the app for a company I was selling with. The app allowed me to build a following and help me sell product! As an influencer I can connect with different brands that I want to work with and before we work together it allows for great conversation and follow up to see if we would be a good fit! Currently I have worked with 6 companies that the app has led me to and I have even become an ambassador for a brand that allowed me to work with them! 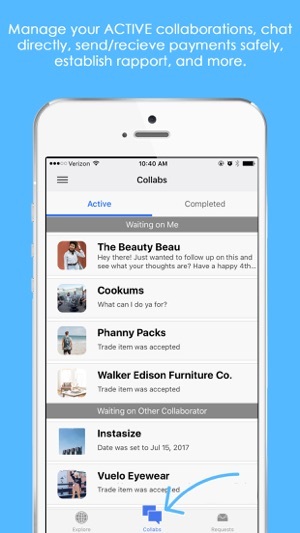 I always suggest Collabor8app to my friends that have businesses and as of right now, I always will! While we respect your opinion, we have little sympathy for users who are found to be abusing the Collabor8 platform as you were (sending hundreds of collab requests in a short time - which we would label as "spam"). In the customer service interaction you mention, you requested a way to "hide" the requests you had made to make it easier to continue sending large volumes of collab requests. Our support agent respectfully told you that your feedback would be passed on to the team, but it's not something we're likely to "fix" (it's functioning as intended). The word "insignificant" was not used to describe you or your issue. When asked why the relevant app functionality isn't considered an issue, the agent pointed out that the typical number of unanswered requests (from non-spamming users) is an insignificant *number* compared to the number of search results, so if you felt offended by that word, it sincerely wasn't our intention to offend you or anyone else. We stand firm by our policies when it comes to spam and abuse in the app, so if you have any concerns about the app's functionality in the context of non-abusive behavior, we're happy to listen and help wherever we can! 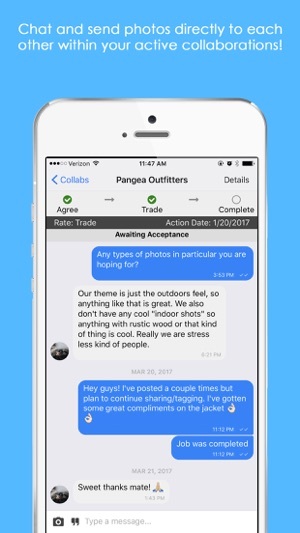 The app isn’t flawless, but it is by far the most successful of its kind, in that there are countless brands and influencers to choose from and collabs actually occur. It is helpful for influencers, too, not just brands. There is NO buying the product, shooting photos, and hoping to be chosen, like in other apps. You’ll definitely have more success if you have 5k+ followers, but it’s worth making a profile no matter what size account you have. There is a “postpone” feature where brands can hold you and watch to see if you improve/grow in addition to a “decline” option. We're glad you like the app. We'll continue to work to improve it!